Keep track of the performance of your kitchen appliances, our Digital Fridge/Freezer Thermometer accurately records temperatures over the range of -49.9 to 69.9°C with a resolution of 0.1 °C/°F and an accuracy of ±1 °C. With its large LCD display, this unit has been programmed with a max/min memory function that enables cooks and chefs to record the highest and lowest temperatures at any given time with an audible alarm for convenience. The compact design incorporated two thermometer sensors - one water resistant probe with flexible 1 meter PVC lead for the appliance temperature and one internal sensor for room temperature. Suitable for mounting on the internal fridge wall, the fridge/freezer thermometer is supplied with a mounting bracket. 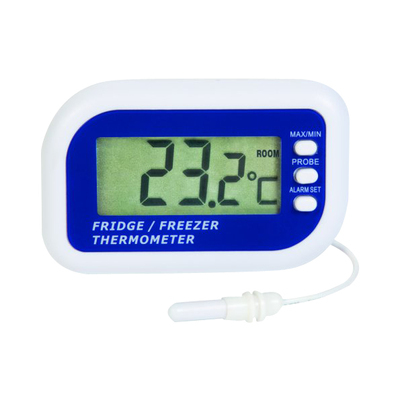 If you're looking for something slightly different, our Fridge Thermometers & Food Probes category has a wide variety of options.